Our Master Trainer is Perry Parks. 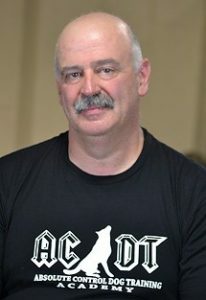 Perry is very well known and highly regarded by all within the dog training profession. Each member of our training staff has been schooled in Perry’s proprietary training techniques so as to be capable of effectively addressing every Client’s needs. Perry Parks is a certified Master Dog Trainer. He became very interested in dogs as a young boy growing up in Cherry Hill, NJ. His fascination soon grew into a passion, which ultimately led to a long career as a highly decorated Police K9 Officer in Medford Township, NJ. He has trained thousands of companion and Police dogs, many of which have won awards at National competitions. Perry is an expert at diagnosing and solving behavioral problems, even those that others have considered unsolvable. “It is better to teach your dog the right way rather than to correct him for what he has done wrong. Always be fair and kind to your dog and at the end of each lesson love and praise your dog!” This is Perry’s core philosophy. Has over 33 years of K9 law enforcement handler and dog training experience. 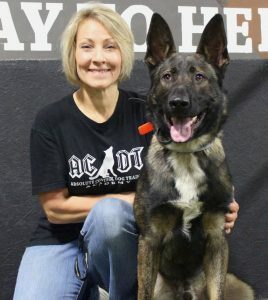 Is recognized as one of the top dog trainers in the United States for companion and law enforcement related dog training disciplines. Served as past President of the United States Police Canine Association Region 15 for two terms. Co-authored and designed the NJ State Attorney General’s K9 Training Program, which has been adopted by other states and remains the standard protocol for training law enforcement dogs. Provides K9, guard dog, and scent detection consultation services to Homeland Security, FBI, Foreign Governments, Public and Private Companies, and Executives looking for discrete solutions to our world’s ever increasing security challenges. Is one of only a few dog-training professionals qualified to serve as an expert witness in Federal Court for Police K9 related litigation cases. Was a US Police K9 Association Regional Judge for 20 years. Has consistently earned the highest recommendations by the veterinary community. Much of Perry’s success is related to his respectful, caring and passionate approach to dogs. Clients find him to be very engaging, likable and effective. Terri O’Brien brings a tremendous amount of dog training experience, passion, and versatility to our ACDT Staff. These qualities and her level of commitment are most evident when she is training or caring for dogs. Clients appreciate Terri’s perfectionism and detail-oriented approach which produce great results, a fun time, and a very well trained dog. Terri oversees our Puppy School and Agility Training programs. If you have a new puppy addition to your family, Terri will ensure that your pup is properly trained. In virtually all cases this will prevent behavioral or environmental related issues from developing. Those issues are common in untrained puppies. Terri is a registered nurse (RN) and nutrition buff. Her fitness and Nutrition programs are well thought out and provide another advantage for your puppy. Please feel free to come out and experience the excitement that we share with our clients and their companions.